Tesco said it welcomed the judgement, which applies only to England and Wales. “We recognise the vital role that ATMs play in the daily lives of our customers and remain committed to providing this service to them,” a spokesperson said. 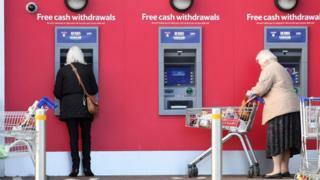 The Co-Op said it was a victory for people who rely on ATMs. “The case had threatened the viability of the ATM network, and risked the future of much-needed banking services across communities,” a Co-Op spokesperson said. But the ruling now leaves a question mark over how the money raised from cash machines will be replaced. This year that is likely to amount to £44.54m, according to the business rates consultancy Altus. The Appeal Court also rejected an attempt by the Valuation Office to get retailers to pay business rates on machines inside their shops as well. This would have hit many small shops and convenience stores. “We especially welcome the Court’s rejection of the Valuation Office’s attempt to separately rate internal machines, the consequences of which would have been dire,” tweeted Mr Schurder. The Valuation Office said it was now considering its position.